Flutters about, sometimes sits down and poses like a gargoyle. The caster enters a stone state and restores 886 health each turn for 3 turns. 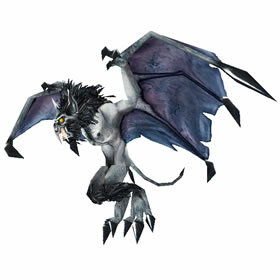 Great pet to take those big hits, and still survive due to high health and a very solid, multi-turn heal. Sunny days could turn this lil monster into an almost unstoppable juggernaut. If used with damage reducing weather effects, it will surely annoy, and frustrate your opponent. A highly underrated pet. 'Stone Form' is an amazing ability for pvp (Heals 630 per round for 3 rounds = 1890 total healing. Great tank pet. I do got one of this dead bird. Stone Form is finally fixed and works as advertised! A huge heal every round for 3 rounds. Nice! @Coulom: From what I can see, it heals once for the tooltip value, not 2 to 2.5 times the amount. At level 25, the tooltip value is 630 and it is healing me for 580-680ish once. You are correct that it fails to heal three times however. Very unfortunate. Stone Form doesn't appear to function as the tooltip describes it. There is a "Stone" animation which includes a stun effect but health is restored at approximately 2 to 2.5 times the tooltip value all in one shot. No stun on the next turn. Dropped for me today. I don't about drop rate, but it was my second char who run Mount Hyjal. A smaller gargoyle that is used to divert the flow of rainwater on scourge buildings to prevent mausoleum flooding.